Haven't You Read This Before? I’ve written enough about that particular topic, and there’s been more written on that subject in the past two weeks than you could possibly read between now and the Inauguration. Another article from me isn’t going to make a difference. It’s time to talk about something else. What is that something else? I don’t know. The tank is running on empty. I’ve been filling it with low-grade fuel called “political coverage”. To get back into the “creativity” mindset, I jumped on Medium to find some inspiration. The problem was that every article I came across was exactly like an article I’d read before. Something about getting out of a creative rut (fitting, right? ), the 100th article about why you should(n’t) start a podcast; I succumbed to another post about Trump voters needing to hold Trump accountable and finally clicked off from there to a CNN article about Trump’s 60 Minutesinterview…before realizing I had fallen into the click-trap. In trying to write an article about the “sameness” of Medium (and Internet content at large)— I had been tricked into wasting 10 minutes reading stuff I had basically read before. If you read my writing — typically about creativity, productivity, and personal growth — I bet you’ve felt this too. That a lot of online writing is drawing from the same shallow well…or perhaps the same low-flow toilet bowl. A quick scroll through the Medium newsfeed will always turn up the latest and not-quite-greatest about getting out of your own way, beating writer’s block, and growing your followers. No matter how much you promise yourself that you’ll stop clicking on those articles, it’s impossible to resist. You’ll inevitably find yourself, five minutes later, reading the same listicle you’ve read before, just in a different order with a few different words by a different author. The key for Elliot is clear — in stealing, the artist must make her work feel novel by stealing not from recent trends, but from artists that don’t circle the same toilet bowl. It’s obvious how we got to now — the daily onslaught of the same 10 articles in a different wrapper — as writers, we committed theft without transformation. We stole from our peers rather than the dead, foreign, or divergent. And as readers, rather than shrugging off the copycats as copycats, we click on every “new” How I Got 10K Followers in Two Weeks post. Thus, we all contribute to a never ending cycle — writers write the same articles because we keep clicking on them, expecting some magic bullet in this one that the previous writer (and the one before that) never discovered. Of course, that’s only part of the problem. Not everyone is writing the exact same thing. Each day, we collectively create and invent so much stuff that it would take over a year to simply preview one 24 hour cycle. Which means the larger issue is that there’s better stuff out there, but we never see it because we don’t know where to look. Here’s where politics makes its way back into the article. When Donald Trump clinched the American presidential nomination, Vox published a seething article blaming Mark Zuckerburg (and Facebook) for the election’s “unexpected” outcome. Granted, it was only “unexpected” to Facebook’s Democratic users. Some basic statistical analysis by Wired revealed the shocking extent of Trump’s online popularity. It was just that those on my side of the aisle never saw it coming. Facebook (and other social platforms) want to show you writing you’ll keep reading, writing that’s personalized to your tastes (and biases). And you end up trapped in a filter bubble, blindly assuming what you’re reading is exactly what everyone else is reading. 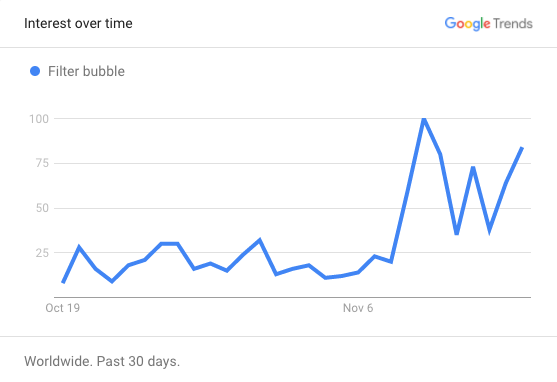 The phrase “filter bubble” has shot up by 75% in Google traffic since Nov. 8th. Of course the “filter bubble” is real. But it’s nothing new. We have separated ourselves into communities by race, religion, region, and interests since the dawn of time. Facebook did blind the left to Trump’s popularity, but it’s moronic to claim that this was somehow Facebook’s fault. It is wholly our own. We overfitted ourselves. We liked what we saw, so we never took the time to step outside our own personal utopia. We do the same thing on Medium. When we click an article, when we give it a heart, we incentivize writers and the platform to show us more on that topic, even if we don’t really want them to. We overfit and find ourselves oversaturated with derivative click-biaty articles we don’t even want to read. But rather than stepping outside the bubble and finding something new, something of real value that piques our deeper curiosity, we lazily keep clicking on headlines we’ve read before. Writers (myself included) — stop looking to Medium (and other content platforms) for inspiration. Stop writing about writing and email lists. Find inspiration in something outside of your stats — sports, music, games, politics, economics. Read more books and less 600 word posts. Listen to new podcasts from the technology or culture section. Stop taking recommendations from close friends — push yourself to read what friends-of-friends or tastemakers you respect are reading. And readers (myself included) — stop clicking on articles you’ve already read. Stop deluding yourself that the next How I Got 10K Followers in One Week will be your salvation. Unsubscribe from the newsletters that rarely, if ever, introduce you to new concepts or turn you on to new sources of inspiration, that parrot the same advice as the last three newsletters you opened. Pursueyour unique interests and reward the writers in that niche with your clicks, hearts, and yes, your dollars. I am not blind to the irony that today, I am part of the problem. But hopefully next week, I don’t have to be. Because together, we can pop the filter bubble and uncover the rich and diverse media landscape that’s flourishing right here under our own detritus.